This is a great make-ahead appetizer that can be made up to 3 days in advance. 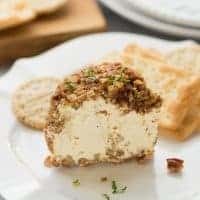 Coat the cheeseball with the pecans only a few hours before serving so they don’t get mushy. I love serving this with gluten-free crackers! The cashews need to be soaked for the cheeseball to have the correct texture. If you’re in a hurry, you can pour boiling water over the cashews and let them sit at room temperature for 1 hour to speed up the soaking process. Place the cashews in a bowl and cover with water. Let sit at room temperature for 6 hours or cover and refrigerate overnight. Place the soaked cashews, cream cheese, lemon zest, lemon juice, nutritional yeast, onion powder, garlic powder, paprika, cayenne pepper and salt in the food processor. Process until completely smooth, about 1-2 minutes. Coat the cheeseball in the toasted pecans, pressing them lightly into the surface. Serve with your favorite crackers. Enjoy! MAKE IT SOY-FREE: Use Kite Hill Almond Milk Cream Cheese instead of a soy-based cheese.